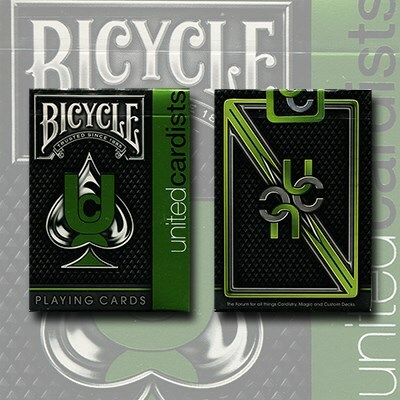 The Bicycle United Cardists Deck was created to promote and support Unitedcardists.com, the best Playing Card Forum on the web today. The deck will have the following specifications: Bicycle Branding Green Foil on the Outside of the Tuck Box, Green Foil on the Inside of the Tuck Box, Embossing on the Tuck Box, Custom Seal, Custom Designed Back, Custom Designed Ace of Spades, Custom Gaff Card, and Custom Colored Court Cards. These cards were printed on Air-Cushion Finish Traditional Bicycle Stock. You will not find a deck with all these upgrades for a better price. As I stated in the description at the beginning, this deck was made to promote their wonderful forum.